Mortgage REITs like these have some of the highest dividends in the market, but it's important to know the risks before investing. Mortgage real estate investment trusts (REITs) are a favorite among many dividend investors, and if you take a look at the chart below, it's easy to see why. Many mortgage REITs pay dividend yields of 10% or more, but there are many different types of mortgage REITs to choose from. Here are five of the top mortgage REITs dividend-seekers may want to consider, as well as a discussion of some of the risks involved with these high-paying investments. Share prices and dividend yields current as of 3/30/2017. The simple explanation of how mortgage REITs work is that they buy mortgage-backed securities, and collect the payments that come from the underlying mortgages. However, most mortgages these days have interest rates in the 3%-5% range, far below the 10% dividend yields many mortgage REITs pay. In order to produce these kinds of dividends, mortgage REITs use borrowed money (aka leverage) to supercharge their income. For example, if a mortgage-backed security pays a 3% dividend yield, and a mortgage REIT can borrow money at 1% interest, it collects the 2% difference, known as the "spread." Of course, the business is significantly more complicated than this. Mortgage REITs can invest in a variety of mortgage-backed securities, such as residential or commercial, agency or non-agency, and varying loan terms, such as 15-year or 30-year. In addition, there are hedging strategies these companies use to protect from interest rate risk, which I'll discuss later. Annaly Capital Management (NYSE:NLY) is the largest, and perhaps best-known of the mortgage REITs. The company invests 80% of its capital in agency mortgage-backed securities (MBS), which are MBS that represent mortgages backed by government-sponsored agencies like Fannie Mae and Freddie Mac. In addition, Annaly has smaller operations in non-agency residential mortgages and commercial mortgages. The company's overall leverage ratio is 6.4-to-1, and it is well-hedged against the effects of expected interest rate hikes. Starwood Property Trust (NYSE:STWD) is the largest commercial mortgage REIT in the U.S., and primarily originates and owns floating-rate commercial loans, which provide a natural hedge against rising interest rates. The company also invests in commercial MBS, physical commercial real estate, and services a large portfolio of mortgages. The average loan-to-value of Starwood's originated loans is an attractive 63.8%, so while commercial mortgages do have higher default risk than say, agency-guaranteed residential mortgages, this puts Starwood in a good position to avoid losses. In fact, the company has no realized loan losses after nearly $22 billion in lending investments. AGNC Investment Corp (NASDAQ:AGNC) invests mainly in agency mortgage-backed securities. Because these are safer than many other types of MBS, they have relatively low yields, and AGNC needs to employ significant leverage to produce its double-digit yield. In fact, AGNC's 7.7-to-one leverage ratio is the highest on this list. The result of this is that AGNC is more susceptible to interest rate risk than many other mortgage REITs. By the company's own estimates, a drop in the net interest rate spread from 150bps to 100bps (it's 145bps currently) would reduce return on equity from 14.5% to 10.8%. However, remember agency MBS have much lower default risk than other mortgage assets, so what you give up in interest rate risk, you gain in the form of higher asset quality. Two Harbors Investment Corp. (NYSE:TWO) invests in agency and non-agency MBS, as well as mortgage servicing rights and commercial real estate assets. Because of the higher yields generated by some of its investments, Two Harbors is able to operate with significantly lower leverage than peers. Its non-agency portfolio is comprised of about 70% subprime mortgages, and the non-agency portfolio as a whole produced an average yield of 9.3%. In fact, the company's 3.8-to-one leverage ratio at the end on 2016 is far below the 6.2-to-one industry average. This leaves it far less susceptible to interest rate risk than many of the others on this list, but it also faces increased default risk due to the inherently riskier nature of its assets. I included PennyMac Mortgage Investment Trust (NYSE:PMT) in this discussion because it takes a rather unique approach to investing in mortgages. Specifically, instead of targeting the highest-quality mortgage assets, PennyMac's largest investment is in distressed mortgage loans, which it can typically acquire at a discount and use to produce attractive risk-adjusted returns. However, in recent years, the portfolio of distressed loans has begun to decline due to sales and liquidation (and a lower supply compared with the post-crisis years when the company was founded). So, PennyMac is now focusing its capital deployment on mortgage service rights and credit risk transfers. To be perfectly clear, mortgage REITs are not low-volatility investments, in any sense of the term. There are a few risk factors with mortgage REITs investors need to know, such as mortgage prepayments and defaults. Some mortgages are better protected from these than others -- for example, agency MBS are guaranteed by the issuing agency, while non-agency MBS have no such protection. The biggest risk investors need to be aware of is interest rate risk, which I've already mentioned a few times in this discussion. Since these REITs use a high degree of leverage and borrow at low, short-term rates, unexpected spikes in interest rates can crush mortgage REIT profits. Just take a look at the effect of a 2013 rate spike (the orange line in the chart) on Annaly Capital Management (the blue line). As a simplified example, let's say that a mortgage REIT can borrow on a short-term basis at 2% interest, and can buy mortgages that pay 4%, resulting in a 2% spread. Using five-to-one leverage, this translates to a 10% yield -- if the short-term interest rate doesn't change. However, let's say that the short-term borrowing rate unexpectedly spikes to 3%. Now the spread is chopped to 1%, and the five-to-one leverage only produces a total yield of 5%, or half as much as before. 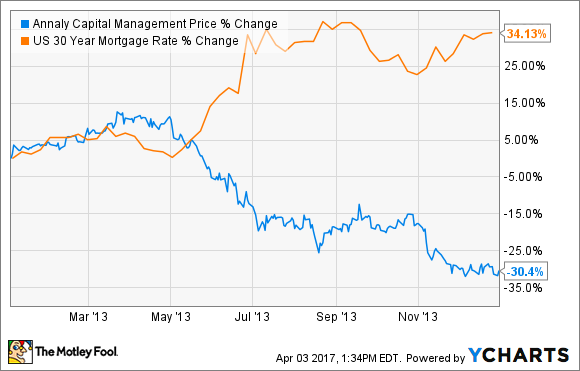 Of course, there's more to the story than this, and mortgage REITs have ways of hedging against rate swings. Even so, interest rate fluctuations, especially those that are rapid and unexpected, can put major pressure on mortgage REIT stocks.